Added to the memorial in 2011. The Queen's Royal Regiment (West Surrey) 2nd Bn. Son of Robert and Amy Monk of Banstead, Surrey. Robert (senior), who was Amy's second husband, had enlisted in WWI and subsequently worked as a bricklayer. Young Robert was a twin and had two sisters one of whom was called Patricia Frances Mary Monk. Patricia attended "public" school in Banstead, worked at the Woolpack as a barmaid and joined the WAAFs when she was 14, got caught and was dismissed, then rejoined at 16. She would later meet, and marry, a Canadian soldier and move to Canada. It was Patricia's daughter Leslie, who first contacted us whilst trying to find information about her family who originally came from Banstead, but it was to be another four years before we established a connection to young Robert Monk who we knew had never been included on the memorial. Robert's inscription on the Rangoon Memorial which bears the names of almost 27,000 men of the Commonwealth land forces who died during the campaigns in Burma and who have no known grave. When asked about Robert, Leslie told us "The last my mother knew, was a cable saying that he was missing in action in Burma and considered a POW. The family did not hear any more until the 1990s when my mum found his name on the War Memorial site in Burma. They didn't know if he had truly been a POW or had escaped and been killed." 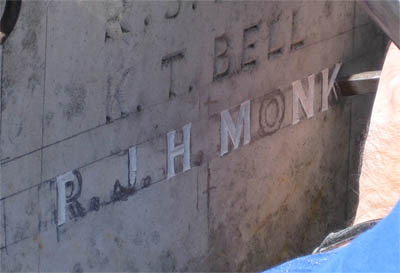 R J H Monk inscribed incorrectly on a WWI panel. Coincidentally, the name above, D R Baple also belongs to a WWII man inscribed in the wrong place. This name has been on the memorial for decades and has therefore been left untouched. 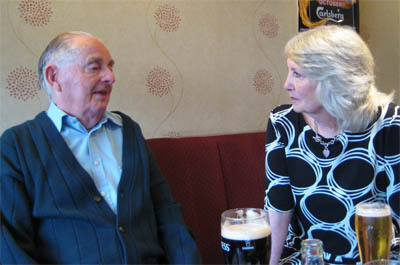 In the meantime we also made contact with Jenny Affleck, daughter of Reginald Monk, Robert senior's brother, and arranged for her to meet with Jim Willis a local man who was a POW at the Bridge over the River Kwai. Robert Monk lived just down the road from Jim and they were good mates. Jim had tried to get his friend added to the memorial several times but had never been successful. Lewis Wood (webmaster and author of THESE MEN OF BANSTEAD) promised that one day, he would make it happen, and with assistance from the local mayor, the British Legion, the Council and the family, this was achieved in 2011. Robert's journey to the WWII panels of the memorial did not go exactly to plan as his name was initially inscribed on a WWI panel, on 18 August. 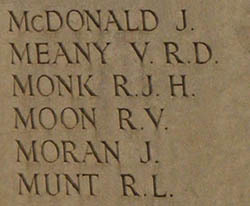 This was quickly corrected and Robert's name was inscribed on the correct panel, however, Robert is the only person within living memory whose name was inscribed in two places on the memorial at the same time, whilst the council and the stone masons worked out the best way of removing the incorrect inscription. This was expertly done a few days later. The stone cutter working on Robert's name. 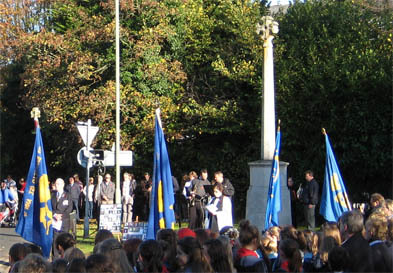 A new name on the memorial requires it to be rededicated and this took place on Remembrance Sunday in November 2011, a beautiful sunny day. The Reverend Maria Pallis, vicar of All Saints Banstead is pictured above conducting the service. Robert was born in Epsom but the family later moved to Lambert Road Banstead where Robert lived with his siblings which included at least one half-sister called Gladys, from his mother's first marriage. From early on, Robert wanted to become a jockey. He was fortunate in living close to Epsom Racecourse, the home of The Derby, where he won his first and only race just before he enlisted. At that time he was great mates with a pal called Jim Willis who lived a few doors down. DETAILS FROM SERVICE RECORD YET TO BE ADDED . . .
Robert's friend Jim, returned from the war in a state of near starvation having been a POW at the Japanese camp by the bridge over the River Kwai. Jim recalled hearing how his best friend was killed by the same enemy, when Robert, whilst serving in Burma, refused to leave his pack animals and was shot dead. Robert enlisted with The Queens Royal Regiment (West Surrey), and the Chindits' War Memorial confirms that Robert's battalion, the 2nd., then took part in operations in Burma in 1943 and 1944. The Chindits, named after the Chinthe, a mythical beast, half lion, half-flying griffin, a symbolic guardian of Burmese temples, operated deep behind enemy lines in North Burma in the war against Japan. For many months they lived in, and fought in the jungles of Burma, then occupied by the Japanese. Their major source of supplies was from allied airdrops. The Queens operated in the second Chindits force often known as Wingate's Chindits, after Major General Orde Wingate DSO who had initially formed the Special Forces group. Under Brigadier Fergusson of the 16th Brigade, the Queens fought alongside the 51st/69th Field Regiment, Royal Artillery, the 2nd Leicestershire and the 45th Reconnaissance Regiment. Each Brigade was divided into columns of some 400 men, and each column required around sixty to seventy-five mules. Ten mules carried the radio equipment, including the batteries, generators and petrol, and the rest other heavy equipment, weapons and supplies. Ponies were also used to carry the wounded. Muleteers were appointed to look after the pack mules which provided the only form of transport in the inhospitable jungle. Robert's experience with horses made him a perfect choice to undertake this role. "The march was the heaviest imaginable. The rain was torrential and almost continuous. No single stretch of level going existed between Tagap and Hkalak, and few thereafter. The cold was intense particularly at bivouacs over 5000 ft. The 70lbs which men were carrying were greatly increased in weight due to saturation with water. A dry bivouac was practically unknown. Leeches were innumerable, but less unpleasant than the Polaung fly whose vicious bites hardened to a septic lump. Wireless communication was difficult and supply dropping on the whole atrocious; up to 40 or 50% of the supplies falling hundreds or thousands of feet down the cliffs and becoming a dead loss. Columns averaged nine days to cover the thirty-five miles from road head to Hkalak." The brigade finally arrived on the 20th March, set up a stronghold which they called 'Aberdeen', and built an airstrip. recalls their adventures, some sixty years later. Wingate had planned to take Indaw, an enemy base, before the Japanese had time to reinforce it, so the 16th Brigade was rushed into the attack without being given time to rest and recuperate from their long march. Despite reinforcements, they did not have the strength to seize the heavily defended base, and had to withdraw. General Wingate was killed in a plane crash, and his replacement ordered the Chindits to abandon their strongholds. The 3rd,14th, and 77th Brigades did as ordered and moved out. After their long march, the men in Robert Monk's brigade, the 16th, were now completely exhausted, and given the orders to withdraw on the 26th April, and fly out. This was some ten days prior to Robert's death. His friend Jim Willis has always maintained that "Robert would not leave his beloved mules and he was killed when the Japanese caught up with him". The story is difficult to verify but it does sound like Robert could not bear to abandon his mules, and when the rest of the 16th Brigade flew out, he stayed behind to ensure the animals were looked after. This selfless act possibly explains why Robert was initially reported as missing in action. It may also explain why Robert was never added to the Banstead War Memorial. Photograph of inscription on Rangoon memorial kindly provided by Tony Beck. Family information from Jenny Affleck.